VIRGINIA BEACH, Va. - Oct. 15, 2018 - PRLog -- According to a 2017 Glocalities research study of over 26,000 people in 24 counties, 61% "believe that there is some form of life on other planets." Almost half of the respondents "believe in the existence of intelligent alien civilizations in the universe." On October 17th, Jean Neff Guthrie, award-winning author from Georgia, releases Mystical Aria: Starship Diary, a tween science fantasy novel about peaceful aliens who make first contact with a psychic girl from Virginia Beach. Starship Diary is Guthrie's sequel to Mystical Aria: Seeking the Gallion Queen, which won Literary Classics 2017 Gold Award for Fantasy - Tween. Set in 2028, the twelve-year-old protagonist from Virginia Beach, Aria Vanir, returns in this sequel with her own writings and alien interviews while aboard a starship with Queen Supreme Nashata, Galactic Mother of the Gallions. First contact with the alien queen, Nashata, transforms Aria into Earth Ambassador to the Gallions. Can Aria summon the courage to tell humans about the Gallions' peaceful messages of love, infinity, and prosperity? For this, she turns to her most trusted companion: her diary. Aria's space adventure unfolds through her innermost thoughts as she journals her visions, dreams, and inner conflicts. What happens on the starship stays in Aria's diary, from mishaps to fave memories with her teen spy sister Jackie, best friend Tommy, and galfriend-for-life Princess LeSom. A futuristic youth show, Aria's Universe, emerges with exclusive alien interviews aboard the starship Rama XI. Why does Princess LeSom like Elvis so much? What initiation did Peakte endure to emerge as the Gallions' greatest inventor? How did alien queen Nashata meet her favorite communicorn, Shemuse, and accept her royal destiny? Lisa Michaels, Georgia author and Founder of Natural Rhythms, reviewed the novel as "A delightful read! 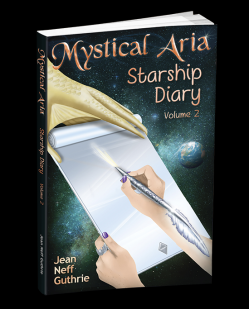 Mystical Aria: Starship Diary enchants readers as they go deeper into the experience of Aria's connection to the Gallions. Jean weaves her storytelling magic again." Guthrie, fifty-four, graduated from Pulaski County High School, class of '82 salutatorian, in Dublin, Virginia. She earned a BS in dairy science from Virginia Tech ('86) and a MS in mass communications from Virginia Commonwealth University ('93). Guthrie's poem, "Baler Twine," written in honor of her father's seventy-fifth birthday, won a National Cattlemen's Magazine contest in 2001. Guthrie lives in Smyrna, Georgia, where she writes sequels in the Mystical Aria series and manages Information Technology projects. Mystical Aria: Starship Diary releases October 17th on Amazon.com. Discounts, free chapters, and announcements are available through http://www.JeanNeffGuthrie.com. For more information and to schedule an interview, contact Guthrie at 678.467.8835 or jean.n.guthrie@gmail.com.